Sunday January 31st 1875 It was very cold this morning but we went to church. I read till dinner was ready after I came home. And immediately after dinner began to write a letter to Rob. But did not complete it as we got to singing and did not stop till time to go to church. Which a part of us did. When we came home Jennie fixed a nice lunch for us. After that was disposed of we all played sociable a little while and went to bed. 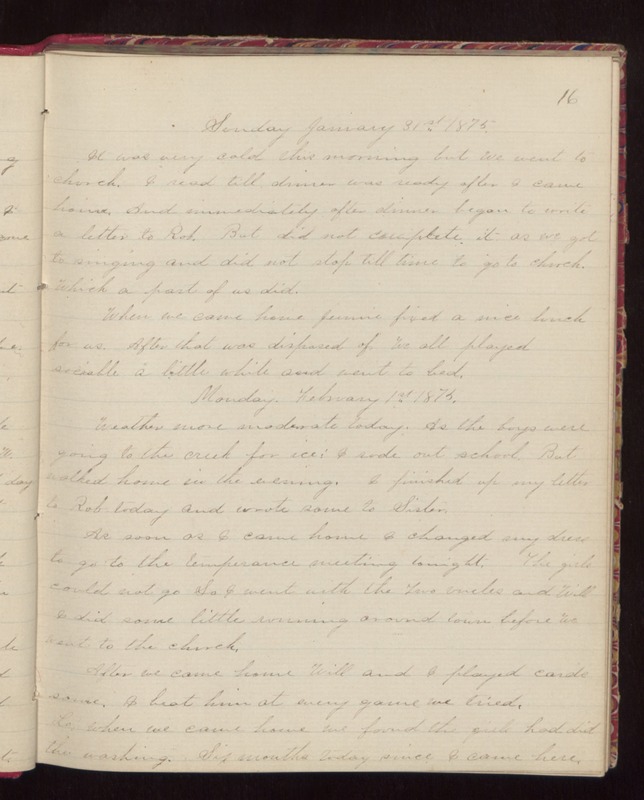 Monday February 1st 1875 Weather more moderate today. As the boys were going to the creek for ice: I rode out school. But walked home in the evening. I finished up my letter to Rob today and wrote some to Sister. As soon as I came home I changed my dress to go to the temperance meeting tonight. The girls could not go So I went with the two uncles and Will. I did some little running around town before we went to the church. After we came home Will and I played cards some. I beat him at every game we tried. Lo! when we came home we found the girls had did the washing. Six months today since I came here.